1. The SH-200A is the small batten receptacle and comes with an SH-400 slide. It accepts flat battens up to 1 5/8" wide and round battens up to 1/2" in diameter. 2. 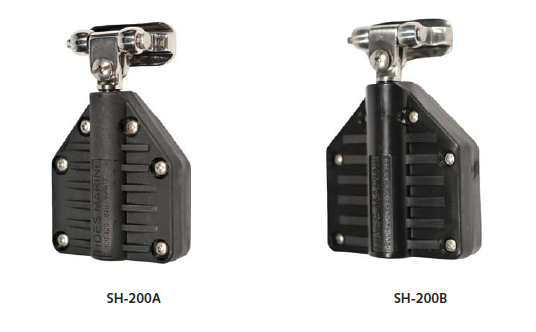 The SH-200B is the large batten receptacle and also comes with an SH-400 slide. It accepts flat battens up to 2" wide and round battens to 5/8" in diameter. Count the number of full-length battens on your sail. Measure the width of your flat battens or the diameter of your round battens. Using this information, select an SH-200A or an SH-200B for each batten on your sail. Some batten ends may have to be trimmed before assembly to optimize fit. Most conventional headboards have a "length along the luff" of 12" or less. This type of configuration should only require one (1) Tides headboard slide (SH-500) fastened / webbed to the middle of the headboard. Longer headboards may require two (2) Tides headboard slides - one at the top of the headboard and one at the bottom. Multi-hull sailboats sail much stiffer than monohulls. If you are fitting a Tides Track System to a multi-hull, you may wish to consider one of the SH-900 headboard car assemblies. The price of these SH-900 units is in addition to the standard cost of the Tides Track System. Tides offers two batten receptacles with its track system. If you wish to use your existing batten receptacles (or those of a competitor), this is possible assuming these receptacles connect to corresponding slides with a 10mm stud. Simply order an SH-400 (below) for each of the receptacles you wish to use. Turn the 10mm stud into "your" batten receptacles and the Tides System will take care of the rest. Count the number of reef points on your sail. A Tides SH-401 slide should be used above each reef point (or cringle). However, if the slide above the reef point is a batten receptacle with a Tides slide, this step is not necessary as the SH-401 is already part of this batten receptacle assembly. Count the remaining existing slides on your sail. These will be replaced with the Tides SH-600 intermediate slides. Summarize all of the slides you have selected and determine if the total falls within the "one slide for every 2 to 3 feet of track" guideline. If so, complete the slide section of the Order Form at this time. If you will need more slides than those which are offered with the standard Tides Track System, contact your loft or Tides Marine for information on how to order additional slides at the regular Retail Price. Now is a good time to total the length of each Tides slide you have ordered to determine a final slide stack height. Compare this stack height to that of your current slides. If the Tides stack height is longer than your original stack height, your sail cover may need to be modified. All batten receptacles will use the SH-401 slide. If your current slides are webbed to the main (or some sort of shackle is used), simply remove the old slides and replace them with the Tides slides. This is covered in more detail in the Sail Track Installation Instructions. If your existing slides are sewn to the luff or you have a bolt rope, your sailmaker will have to sew web loops onto your sail to complete this installation.